Petadolex® Pro-Active / 60 softgels - Nature's Way®. The patented method of extraction for Petadolex Pro-Active ensures the valuable petasites compounds are captured, while leaving out toxic levels of inherent compounds such as pyrrolizidine alkaloids. This product is tested for pyrrolizidine alkaloids, made possible by using this patented process (U.S. Patent #6,551,626). Take 1 softgel three times daily. Caution: Discontinue use and consult a healthcare professional if you have a liver disorder or develop symptoms of liver trouble such as abdominal pain, dark urine or jaundice. If pregnant, nursing or taking any medications, consult a healthcare professional before use. Petadolex® Pro-Active is distributed by Enzymatic Therapy under license from Weber & Weber. 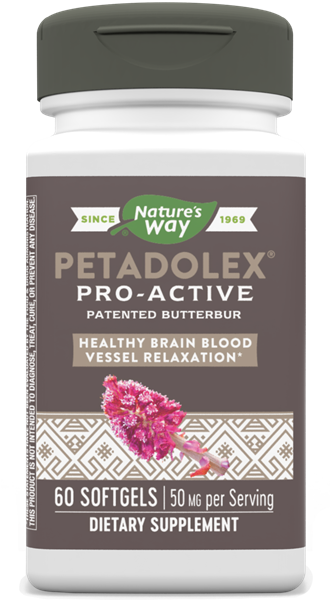 Where is the butterbur plant used in Petadolex® Pro-Active grown? The butterbur plant used in Petadolex® Pro-Active is grown on farms in Germany and Switzerland. I am taking 3 Petadolex® Pro-Active softgels per day with good results. Why do I have to reduce the dosage to 2 per day after the first month? The recommendations are based on clinical study results. The reduced dosage has been shown to effectively maintain benefits when used on an on-going basis. If you find that a higher dosage works better, up to three Petadolex softgels can be taken every day. What’s the difference between Petadolex® Pro-Active and Petadolex® ASAP?